Be careful. Law has many subtleties, and a word-for-word translation might give a horribly wrong impression. There are established sources with fairly reliable translations of different laws. For instance, Constitutions of the Countries of the World has English translations of constitutions that are prepared by experts. The set often includes copies in the original languages as well. A great source for finding laws in translation for most countries is the Foreign Law Guide, a database linked from the library's homepage. Curious about why September 30 was chosen to be International Translation Day? It honors St. Jerome, the patron saint of translators (because of his translations of the Bible). For more about Jerome, see these articles in The Interpreter Hall of Fame, the Catholic Encyclopedia, and Catholics Online. He is also listed as the patron saint of students and of librarians, so we all have something in common. DNA identification, economic estimates of damages, psychiatric evidence of competence to stand trial, engineers' testimony about product defects—there's a lot of scientific testimony in today's courtrooms. How can judges—who are not statisticians, geneticists, economists, epidemiologists, engineers, or psychiatrists—intelligently manage this flood of information? To address this challenge, the Federal Judicial Center and the National Research Council have published the Reference Manual on Scientific Evidence. The first edition was in 1994, the second in 2000, and the third edition was released yesterday. The book is available for free reading online; you can also download a PDF of any chapter or of the whole book. And the library will soon order it in paper. 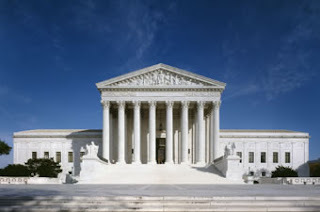 See Science Manual for Judges Updated, Law Technology News, Sept. 29, 2011. Would you like to know what cases are coming up at the Supreme Court? The LII Supreme Court Bulletin (from the Legal Information Institute at Cornell) is an email newsletter that summarizes upcoming cases. This year's first issue, Sept. 16, highlights seven important cases the editors selected. The Sept. 23 issue, for instance, summarizes the six cases that will be argued Oct. 3, 4, and 5. While the LII Supreme Court Bulletin offers just brief summaries in an unadorned format, SCOTUSblog provides analysis and commentary about pending cases, decided cases, cases that were denied review, advocacy, and more. The blog was founded by a couple of lawyers who frequently have cases before the Court. Now the team includes an experienced journalist and contributing law professors. For almost 40 years, the American Bar Association has published Preview of United States Supreme Cases as part of its public education mission. Now in addition to the magazine, there's a rich website. You get the articles analyzing selected cases before they are argued. AND you get reporting after they are arguem. But wait, there's more! You also get PDFs of ALL the briefs in ALL the cases before the Court! And of course you can visit the Supreme Court's own website. The docket will let you track the filings and argument dates for cases. After a case has been argued, you can listen to an audio recording or read a transcript. And after the case is decided, you can read the Court's opinion. You can also find information about the Court, such as biographies of current Justices. By the way, have you noticed the display about the Supreme Court at the law library's entrance? Take a look next time you come in. Sandra Day O’Connor sworn in, September 25, 1981. Today is the 30th anniversary of Sandra Day O'Connor being sworn in as a Supreme Court Justice. So I thought this might be a good occasion to offer some stats about the representation of women on the federal bench. I'm using a fascinating database from the Federal Judicial Center, The Biographical Directory of Federal Judges. First, how many women did Justice O'Connor join when she was sworn in? And what were the corresponding numbers for men? 2023 men had been commissioned, and 619 were still serving. President Reagan made history by appointing the first woman to the Supreme Court. What was his record throughout the federal courts? An important part of the historical context is that women were a minority in the legal profession. 1972 was the first year when women were over 10% of law school enrollment nationally, so in the 1980s there'd wasn't as large a pool of experienced female lawyer from whom to select judges as there is today. Speaking of today, what is the makeup of our federal bench now? Photo credit: National Archives Today's Document blog, Sept. 25, 2011. Penny A. Hazelton, The Education and Training of Law Librarians, in THE IALL INTERNATIONAL HANDBOOK OF LEGAL INFORMATION MANAGEMENT 43-64 (Richard A. Danner & Jules Winterton eds., 2011). As Director of the Law Librarianship Program at the University of Washington Information School since 1985, School of Law Professor and Associate Dean Penny Hazelton shares her extensive knowledge and expertise in an article discussing the history, current state, and future education and training of law librarians worldwide. The article first considers the competencies for law librarianship, which are the necessary knowledge and skills needed to succeed in the profession. Hazelton then describes the history of law librarianship in the United States, and the continuing evolution of formal and informal education and training programs necessary to meet these competencies. Also discussed are the issues and opportunities associated with educating and traini ng law librarians to become proficient in foreign, comparative, and international law research. 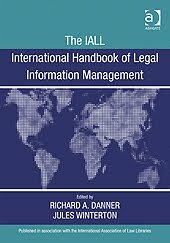 Hazelton explores the global perspective on law librarianship, describing the work of professional organizations such as the International Association of Law Libraries (IALL), and setting forth specific ideas and opportunities to advance the profession of law librarianship worldwide. This article is a must-read for anyone who is interested in learning more about the education and training of law librarians on a global level. Hazelton's article appears in Chapter 3 of this book, located in the Classified Stacks at Z675.L2I15. Prof. Howard Wasserman asks how the different courses at Hogwarts (Defense Against the Dark Arts, Potions, etc.) would map onto the law school curriculum. Hogwarts College of Law, PrawfsBlawg, Sept. 10, 2011.
criminal law - defense against the dark arts (fighting the powers of darkness, be that criminals or prosecutors, depending on your perspective). property - transfiguration (tea kettle-> hamster = squatter -> legitimate owner through adverse possession). civil procedure - potions (keep your complaint boiling on the burner for ten days before adding shredded service of process!). con law - history of magic (one arcane, focused version of history is much like another). torts - charms (a sound grasp of charms is an important client-generation tool for the potential tort lawyer). One difference: if you're a law student with a Husky Card, the librarian won't get mad if you're discovered doing research after closing. Go for it! The Washington State Redistricting Commission released the first set of proposed maps yesterday, showing possible configurations for the state’s congressional boundaries. 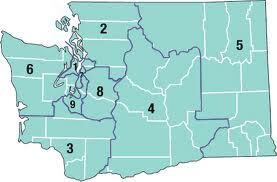 Due to population growth, Washington is gaining a 10th congressional district. Boundaries for the state’s 49 legislative districts will also be redrawn. The Commission has four voting members: 2 Democrats and 2 Republicans. You can see each commissioner’s presentation, legislative plan, and congressional plan here. The Olympian, Redistricting: New Minority Seat? The process is governed by the Redistricting Act, RCW 44.05. The books are free, but you are encouraged to donate to the Legal Information Institute, a nonprofit based at Cornell that puts a lot of resources into making law accessible. The Fred T. Korematsu Center for Law and Equality at Seattle University School of Law presents Beate Sirota Gordon, author of the women’s rights clause in Japan’s Constitution, Thur., Sept. 22, 2011. Ms. Gordon will give a public lecture at 5:00; a reception will follow at 6:00. Ms. Gordon was a member of the 25-member Constitutional Assembly created in Japan in 1946 by General Douglas MacArthur, Supreme Commander in post-World War II Occupied Japan. At the age of 22, Gordon attended a secret meeting between American and Japanese officials about the women’s rights clause she wrote for Japan’s new Constitution, which guarantees women equal rights with men and remains unamended today. Japan’s Constitution also guarantees Japan’s peaceful roles in world affairs and democracy. The Japanese prime minister's website includes the constitution in English.